With the aid of these active experimental sciences man becomes an inventor of phenomena, a real foreman of creation; and under this head we cannot set limits to the power that he may gain over nature through future progress of the experimental sciences. Original French text in Introduction à l'Étude de la Médecine Expérimentale (1898), 32. English version from An Introduction to the Study of Experimental Medicine (1865), as translated by Henry Copley Greene (1957), 18. In Orison Swett Marden, 'Bell Telephone Talk: Hints on Success by Alexander G. Bell', How They Succeeded: Life Stories of Successful Men Told by Themselves (1901), 35. A little science is something that they must have. I should like my nephews to know what air is, and water; why we breathe, and why wood burns; the nutritive elements essential to plant life, and the constituents of the soil. And it is no vague and imperfect knowledge from hearsay I would have them gain of these fundamental truths, on which depend agriculture and the industrial arts and our health itself; I would have them know these things thoroughly from their own observation and experience. Books here are insufficient, and can serve merely as aids to scientific experiment. A man loses his fortune; he gains earnestness. His eyesight goes; it leads him to a spirituality... We think we are pushing our own way bravely, but there is a great Hand in ours all the time. About eight days ago I discovered that sulfur in burning, far from losing weight, on the contrary, gains it; it is the same with phosphorus; this increase of weight arises from a prodigious quantity of air that is fixed during combustion and combines with the vapors. This discovery, which I have established by experiments, that I regard as decisive, has led me to think that what is observed in the combustion of sulfur and phosphorus may well take place in the case of all substances that gain in weight by combustion and calcination; and I am persuaded that the increase in weight of metallic calxes is due to the same cause... This discovery seems to me one of the most interesting that has been made since Stahl and since it is difficult not to disclose something inadvertently in conversation with friends that could lead to the truth I have thought it necessary to make the present deposit to the Secretary of the Academy to await the time I make my experiments public. Sealed note deposited with the Secretary of the French Academy 1 Nov 1772. Oeuvres de Lavoisier, Correspondance, Fasc. II. 1770-75 (1957), 389-90. Adapted from translation by A. N. Meldrum, The Eighteenth-Century Revolution in Science (1930), 3. Address, in 'Report to the Chemical Society's Jubilee', Nature (26 Mar 1891), 43, 493. Although [Charles Darwin] would patiently go on repeating experiments where there was any good to be gained, he could not endure having to repeat an experiment which ought, if complete care had been taken, to have told its story at first—and this gave him a continual anxiety that the experiment should not be wasted; he felt the experiment to be sacred, however slight a one it was. He wished to learn as much as possible from an experiment, so that he did not confine himself to observing the single point to which the experiment was directed, and his power of seeing a number of other things was wonderful. ... Any experiment done was to be of some use, and ... strongly he urged the necessity of keeping the notes of experiments which failed, and to this rule he always adhered. In Charles Darwin: His Life Told in an Autobiographical Chapter, and in a Selected Series of his Published Letters (1908), 92. To lose a rotting member is a gain. An experiment differs from an observation in this, that knowledge gained through observation seems to appear of itself, while that which an experiment brings us is the fruit of an effort that we make, with the object of knowing whether something exists or does not exist. Traité sur l'expérience en médecine (1774), Vol. 1, 45. In Claude Bernard, Henry C. Greene, L. J. Henderson, An Introduction to the Study of Experimental Medicine (1957), 6. Another advantage of observation is, that we may gain knowledge all the day long, and every moment of our lives, and every moment of our existence, we may be adding to our intellectual treasures thereby. In Interesting Anecdotes, Memoirs, Allegories, Essays, and Poetical Fragments (1793), Vols 3-4, Vol 4, 73. But, because my private lectures and domestic pupils are a great hinderance and interruption of my studies, I wish to live entirely exempt from the former, and in great measure from the latter. … in short, I should wish to gain my bread from my writings. Reply upon being offered a professorship. Quoted in John Elliot Drinkwater Bethune, Life of Galileo Galilei (1832), 63. Can the cultural evolution of higher ethical values gain a direction and momentum of its own and completely replace genetic evolution? I think not. The genes hold culture an a leash. The leash is very long, but inevitably values will be constrained in accordance with their effects in the human gene pool. The brain is a product of evolution. Human behaviour—like the deepest capacities for emotional response which drive and guide it—is the circuitous technique by which human genetic material has been and will be kept intact. Morality has no other demonstrable ultimate function. In On Human Nature (1978), 167. In William Andrew Rottschaefer, The Biology and Psychology of Moral Agency (1998), 58. Creating a new theory is not like destroying an old barn and erecting a skyscraper in its place. It is rather like climbing a mountain, gaining new and wider views, discovering unexpected connections between our starting point and its rich environment. But the point from which we started out still exists and can be seen, although it appears smaller and forms a tiny part of our broad view gained by the mastery of the obstacles on our adventurous way up. Ere long intelligence—transmitted without wires—will throb through the earth like a pulse through a living organism. 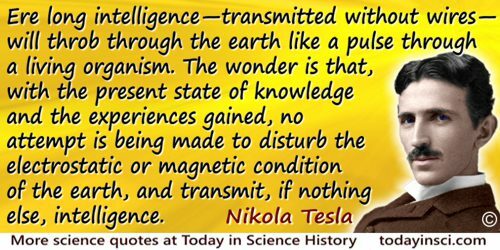 The wonder is that, with the present state of knowledge and the experiences gained, no attempt is being made to disturb the electrostatic or magnetic condition of the earth, and transmit, if nothing else, intelligence. 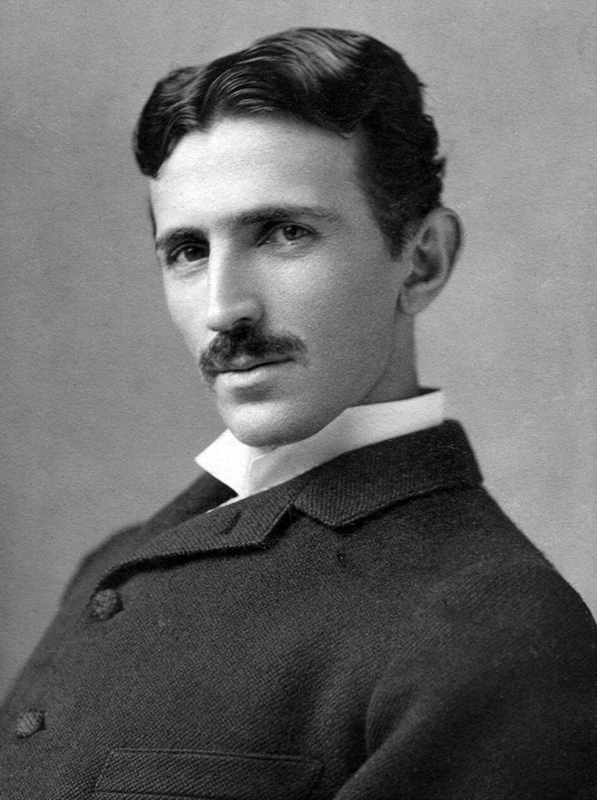 Electrical Engineer (24 Jun 1892), 11, 609. Experimentation is the least arrogant method of gaining knowledge. The experimenter humbly asks a question of nature. 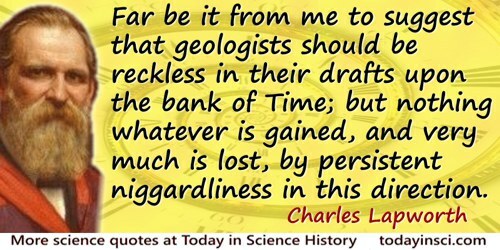 Far be it from me to suggest that geologists should be reckless in their drafts upon the bank of Time; but nothing whatever is gained, and very much is lost, by persistent niggardliness in this direction. Proceedings of the Geological Society of London (1903), 59, lxxii. Buried deep truth ever lies! In Edgar A. Bowring (trans. ), The Poems of Schiller (1875), 260. 'Books of the Times'. New York Times (9 Dec 1965), 45. In 'Germs', The Lives of a Cell: Notes of a Biology Watcher (1974), 90. I can’t prove it, but I’m pretty sure that people gain a selective advantage from believing in things they can’t prove. In David Stokes, Nicholas Wilson and Martha Mador, Entrepreneurship (2009), 190. I have no knowledge other than that gained through my own eyes. In De La Pirotechnia (1540). As translated in Pirotechnia (1959), 70. I would not have it inferred ... that I am, as yet, an advocate for the hypothesis of chemical life. The doctrine of the vitality of the blood, stands in no need of aid from that speculative source. If it did, I would certainly abandon it. For, notwithstanding the fashionableness of the hypothesis in Europe, and the ascendancy it has gained over some minds in this country [USA], it will require stubborn facts to convince me that man with all his corporeal and intellectual attributes is nothing but hydro-phosphorated oxyde of azote ... When the chemist declares, that the same laws which direct the crystallization of spars, nitre and Glauber's salts, direct also the crystallization of man, he must pardon me if I neither understand him, nor believe him. Medical Theses (1805), 391-2, footnote. If it were true what in the end would be gained? Nothing but another truth. Is this such a mighty advantage? We have enough old truths still to digest, and even these we would be quite unable to endure if we did not sometimes flavor them with lies. Aphorism 10 in Notebook E (1775-1776), as translated by R.J. Hollingdale in Aphorisms (1990). Reprinted as The Waste Books (2000), 63. In all cases of the motion of free material points under the influence of their attractive and repulsive forces, whose intensity depends solely upon distance, the loss in tension is always equal to the gain in vis viva, and the gain in the former equal to the loss in the latter. Hence the sum of the existing tensions and vires vivae is always constant. In this most general form we can distinguish our law as the principle of the conservation of force. 'On the Conservation of Force; a Physical Memoir'. In John Tyndall and William Francis (eds. ), Scientific Memoirs: Natural Philosophy (1853), 121. In consequence of Darwin's reformed Theory of Descent, we are now in a position to establish scientifically the groundwork of a non-miraculous history of the development of the human race. ... If any person feels the necessity of conceiving the coming into existence of this matter as the work of a supernatural creative power, of the creative force of something outside of matter, we have nothing to say against it. But we must remark, that thereby not even the smallest advantage is gained for a scientific knowledge of nature. Such a conception of an immaterial force, which as the first creates matter, is an article of faith which has nothing whatever to do with human science. In Ernst Haeckel and E. Ray Lankester (trans. ), The History of Creation (1880), Vol. 1, 6-9. In physical science … whatever knowledge is once gained forms a lasting fund for afterages to inherit and trade with. In paper delivered before the Royal College of Surgeons of England (15 Feb 1932), in 'The Commemoration of Great Men', British Medical Journal (1932), 1, 32. Collected in The Collected Papers of Wilfred Trotter, FRS (1941), 29. It is the utmost folly to denounce capital. To do so is to undermine civilization, for capital is the first requisite of every social gain, educational, ecclesiastical, political, or other. In William Graham Sumner and Albert Galloway Keller, The Challenge of Facts: And Other Essays (1914), 27. It was not easy for a person brought up in the ways of classical thermodynamics to come around to the idea that gain of entropy eventually is nothing more nor less than loss of information. Letter to Irving Langmuir, 5 Aug 1930. 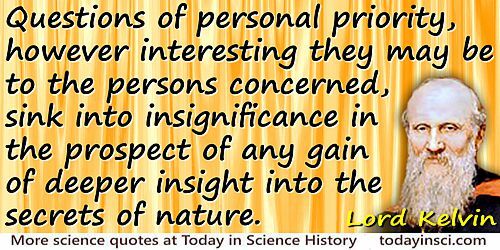 Quoted in Nathan Reingold, Science in America: A Documentary History 1900-1939 (1981), 400. Its [the anthropological method] power to make us understand the roots from which our civilization has sprung, that it impresses us with the relative value of all forms of culture, and thus serves as a check to an exaggerated valuation of the standpoint of our own period, which we are only too liable to consider the ultimate goal of human evolution, thus depriving ourselves of the benefits to be gained from the teachings of other cultures and hindering an objective criticism of our own work. 'The History of Anthropology', Science, 1904, 20, 524. Knowledge must be gained by ourselves. Mankind may supply us with facts; but the results, even if they agree with previous ones, must be the work of our own minds. The Young Duke (1831), 163-4. Man was made to try. Afterward he’s free to keep or throw away what pleasures or what promise that he’s found. What knowledge gained or stumbled on can be discarded or retained. Mr. [Granville T.] Woods says that he has been frequently refused work because of the previous condition of his race, but he has had great determination and will and never despaired because of disappointments. He always carried his point by persistent efforts. He says the day is past when colored boys will be refused work only because of race prejudice. There are other causes. First, the boy has not the nerve to apply for work after being refused at two or three places. Second, the boy should have some knowledge of mechanics. 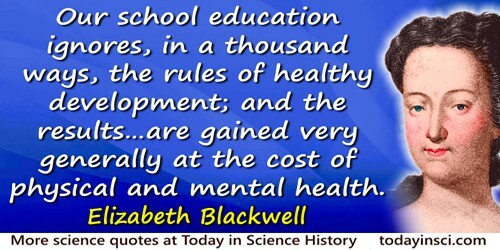 The latter could be gained at technical schools, which should be founded for the purpose. And these schools must sooner or later be established, and thereby, we should be enabled to put into the hands of our boys and girls the actual means of livelihood. From William J. Simmons, Men of Mark: Eminent, Progressive and Rising (1887), 108. My observations of the young physicists who seem to be most like me and the friends I describe in this book tell me that they feel as we would if we had been chained to those same oars. Our young counterparts aren’t going into nuclear or particle physics (they tell me it’s too unattractive); they are going into condensed-matter physics, low-temperature physics, or astrophysics, where important work can still be done in teams smaller than ten and where everyone can feel that he has made an important contribution to the success of the experiment that every other member of the collaboration is aware of. Most of us do physics because it’s fun and because we gain a certain respect in the eyes of those who know what we’ve done. Both of those rewards seem to me to be missing in the huge collaborations that now infest the world of particle physics. Alvarez: Adventures of a Physicist (1987), 198. Neither the Army nor the Navy is of any protection, or very slight protection, against aerial raids. We may therefore look forward with certainty to the time that is coming, and indeed is almost now at hand, when sea power and land power will be secondary to air power, and that nation which gains control of the air will practically control the world. In 'Preparedness for Aerial Defense', Addresses Before the Eleventh Annual Convention of the Navy League of the United States, Washington, D.C., April 10-13, 1916 (1916), 76. Source unverified. Please contact Webmaster if you know the primary source. 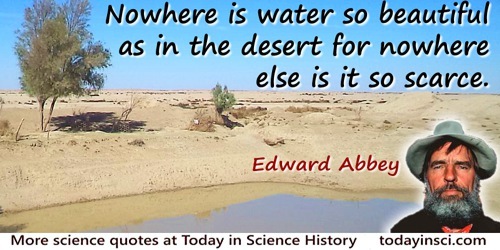 Nowhere is water so beautiful as in the desert for nowhere else is it so scarce. By definition. Water, like a human being or a tree or a bird or a song gains value by rarity, singularity, isolation. In a humid climate water is common. In the desert each drop is precious. Essay in Desert Images, collected in Beyond the Wall: Essays from the Outside (1984), 82. Opium is the only drug to' be rely'd on—all the boasted nostrums only take up time, and as the disease [is] often of short duration, or of small quantity, they have gain'd credit which they do not deserve. Quoted in Desmond King-Hele, Erasmus Darwin: A Life of Unequalled Achievement (1999), 161. Perhaps some day in the dim future it will be possible to advance the computations faster than the weather advances and at a cost less than the saving to mankind due to the information gained. But that is a dream. Weather Prediction by Numerical Process (1922), 66. Quoted in Peter Lynch, The Emergence of Numerical Weather Prediction (2006), vii. Science has but one fashion—to lose nothing once gained. In chapter 'Oliver Wendell Holmes: A Poet of the Old School', Poets of America (1885), 275. Also in The Century Illustrated Monthly Magazine (Feb 1885), 29, New Series Vol. 7, No. 4, 503. So use all that is called Fortune. Most men gamble with her, and gain all, and lose all, as her wheel rolls. But do thou leave as unlawful these winnings, and deal with Cause and Effect, the Chancellors of God. From 'Self-Reliance', collected in The Complete Works of Ralph Waldo Emerson (1903), 89. As quoted in Robert Édouard Moritz, Memorabilia Mathematica; Or, The Philomath's Quotation-Book (1914), 152-153, citing Stobaeus, Edition Wachsmuth (1884), Ecl. II. Speaking concretely, when we say “making experiments or making observations,” we mean that we devote ourselves to investigation and to research, that we make attempts and trials in order to gain facts from which the mind, through reasoning, may draw knowledge or instruction. Speaking in the abstract, when we say “relying on observation and gaining experience,” we mean that observation is the mind's support in reasoning, and experience the mind's support in deciding, or still better, the fruit of exact reasoning applied to the interpretation of facts. It follows from this that we can gain experience without making experiments, solely by reasoning appropriately about well- established facts, just as we can make experiments and observations without gaining experience, if we limit ourselves to noting facts. Observation, then, is what shows facts; experiment is what teaches about facts and gives experience in relation to anything. From An Introduction to the Study of Experimental Medicine (1865), as translated by Henry Copley Greene (1957), 11. The average scientist is good for at most one revolution. Even if he has the power to make one change in his category system and carry others along, success will make him a recognized leader, with little to gain from another revolution. In An Introduction to General Systems Thinking (1975). 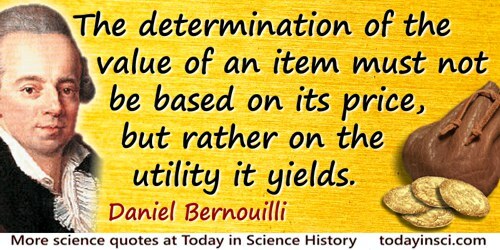 The determination of the value of an item must not be based on its price, but rather on the utility it yields. The price of the item is dependent only on the thing itself and is equal for everyone; the utility, however, is dependent on the particular circumstances of the person making the estimate. Thus there is no doubt that a gain of one thousand ducats is more significant to a pauper than to a rich man though both gain the same amount. Exposition of a New Theory on the Measurement of Risk (1738), 24. The large collection of problems which our modern Cambridge books supply will be found to be almost an exclusive peculiarity of these books; such collections scarcely exist in foreign treatises on mathematics, nor even in English treatises of an earlier date. This fact shows, I think, that a knowledge of mathematics may be gained without the perpetual working of examples. … Do not trouble yourselves with the examples, make it your main business, I might almost say your exclusive business, to understand the text of your author. In 'Private Study of Mathematics', Conflict of Studies and other Essays (1873), 74. The many who believe they are the wiser for reading accounts of experiments deceive themselves. It is as impossible to learn science from hearsay as to gain wisdom from proverbs. Said by the fictional character Lydia in Cashel Byron’s Profession (1886, 1906), 87-88. The theory of evolution has often been perverted so as to indicate that what is merely animal and brutal must gain the ascendancy. The contrary seems to me to be the case, for in man it is the spirit, and not the body, which is the deciding factor. In Proceedings of Linnean Society of London (1913), 36. The theory which I would offer, is simply, that as the land with the attached reefs subsides very gradually from the action of subterranean causes, the coral-building polypi soon raise again their solid masses to the level of the water: but not so with the land; each inch lost is irreclaimably gone; as the whole gradually sinks, the water gains foot by foot on the shore, till the last and highest peak is finally submerged. Journal of Researches: into the Natural History and Geology of the Countries Visited During the Voyage of H.M.S. Beagle Round the World (1839), ch. XXll, 557. The world is desperately imperfect. Even if a quarter of the working people were engrossed in new thoughts and inventions and lived off the others, humanity would still gain tremendously thanks to the constant stream of inventions and intellectual work emerging from this horde of people striving upward. Manuscript (1918), 'The Genius of the People'. Their specific effect on the glucosides might thus be explained by assuming that the intimate contact between the molecules necessary for the release of the chemical reaction is possible only with similar geometrical configurations. To give an illustration I will say that enzyme and glucoside must fit together like lock and key in order to be able to exercise a chemical action on each other. This concept has undoubtedly gained in probability and value for stereochemical research, after the phenomenon itself was transferred from the biological to the purely chemical field. It is an extension of the theory of asymmetry without being a direct consequence of it: for the conviction that the geometrical structure of the molecule even for optical isomers exercises such a great influence on the chemical affinities, in my opinion could only be gained by new actual observations. 'Einfluss der Configuration auf die wirkung der Enzyme', Berichte der deutschen Chemischen Gesellschaft, 1894, 27, 2985-93. Trans. B. Holmstedt and G. Liljestrand (eds.) Readings in Pharmacology (1963), 251. With co-author Kenneth William Ford Geons, Black Holes, and Quantum Foam: A Life in Physics (1998, 2010), 153. There are things out there that are very simple and you never think would work. … Wikipedia is one of those that it would never occur to me that something like that would work. … But it does work. … People who have taken fairly simple ideas, … at a certain scale and after they gain a certain amount of momentum, they can really take off and work. And that’s really an amazing thing. Guest Lecture, UC Berkeley, 'Search Engines, Technology, and Business' (3 Oct 2005). At 1:13 in the YouTube video. 'Biology and the State', The Advancement of Science: Occasional Essays & Addresses (1890), 108-9. To pick a hole–say in the 2nd law of Ωcs, that if two things are in contact the hotter cannot take heat from the colder without external agency. Now let A & B be two vessels divided by a diaphragm and let them contain elastic molecules in a state of agitation which strike each other and the sides. Let the number of particles be equal in A & B but let those in A have equal velocities, if oblique collisions occur between them their velocities will become unequal & I have shown that there will be velocities of all magnitudes in A and the same in B only the sum of the squares of the velocities is greater in A than in B. When a molecule is reflected from the fixed diaphragm CD no work is lost or gained. If the molecule instead of being reflected were allowed to go through a hole in CD no work would be lost or gained, only its energy would be transferred from the one vessel to the other. Now conceive a finite being who knows the paths and velocities of all the molecules by simple inspection but who can do no work, except to open and close a hole in the diaphragm, by means of a slide without mass. Let him first observe the molecules in A and when lie sees one coming the square of whose velocity is less than the mean sq. vel. of the molecules in B let him open a hole & let it go into B. Next let him watch for a molecule in B the square of whose velocity is greater than the mean sq. vel. in A and when it comes to the hole let him draw and slide & let it go into A, keeping the slide shut for all other molecules. Then the number of molecules in A & B are the same as at first but the energy in A is increased and that in B diminished that is the hot system has got hotter and the cold colder & yet no work has been done, only the intelligence of a very observant and neat fingered being has been employed. Or in short if heat is the motion of finite portions of matter and if we can apply tools to such portions of matter so as to deal with them separately then we can take advantage of the different motion of different portions to restore a uniformly hot system to unequal temperatures or to motions of large masses. Only we can't, not being clever enough. Letter to Peter Guthrie Tait (11 Dec 1867). In P. M. Harman (ed. ), The Scientific Letters and Papers of James Clerk Maxwell (1995), Vol. 2, 331-2. To test a perfect theory with imperfect instruments did not impress the Greek philosophers as a valid way to gain knowledge. The New Intelligent Man's Guide to Science (1965), Vol. 1, 12. In A Tramp Abroad (1907), 170. Well: what we gain by science is, after all, sadness, as the Preacher saith. The more we know of the laws and nature of the Universe the more ghastly a business we perceive it all to be—and the non-necessity of it. Where should I start? Start from the statement of the problem. ... What can I do? Visualize the problem as a whole as clearly and as vividly as you can. ... What can I gain by doing so? You should understand the problem, familiarize yourself with it, impress its purpose on your mind. How to Solve It: a New Aspect of Mathematical Method (1957), 33.
Who runs may read the scroll which reason has placed as a warning over the human menageries: “chained, not tamed.” And yet who can doubt that the leaven of science, working in the individual, leavens in some slight degree the whole social fabric. Reason is at least free, or nearly so; the shackles of dogma have been removed, and faith herself, freed from a morganatic alliance, finds in the release great gain. Address to the Wistar Institute of Anatomy and Biology of the University of Pennsylvania (1894). Collected in 'The Leaven of Science', Aequanimitas (1904), 100. A “morganatic” alliance is one between persons of unequal rank, the noble and the common. With the experience and knowledge gained on the moon, we will then be ready to take the next steps of space exploration: human missions to Mars and to worlds beyond. Speech, NASA Headquarters (14 Jan 2004). In Office of the Federal Register (U.S.) Staff (eds. ), Public Papers of the Presidents of the United States, George W. Bush (2007), 58. [1665-06-11] I out of doors a little to show forsooth my new suit, and back again; and in going, saw poor Dr Burnets door shut. But he hath, I hear, gained goodwill among his neighbours; for he discovered it himself first, and caused himself to be shut up of his own accord - which was very handsome. 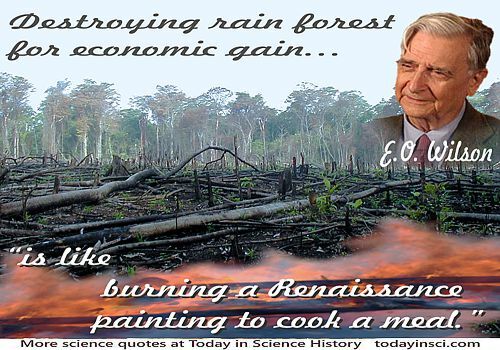 [Destroying rain forest for economic gain] is like burning a Renaissance painting to cook a meal. [For the] increase of knowledge and … the useful application of the knowledge gained, … there never is a sudden beginning; even the cloud change which portends the thunderstorm begins slowly. From address, 'A Medical Retrospect'. Published in Yale Medical Journal (Oct 1910), 17, No. 2, 59. [M]y work, which I’ve done for a long time, was not pursued in order to gain the praise I now enjoy, but chiefly from a craving after knowledge, which I notice resides in me more than in most other men. And therewithal, whenever I found out anything remarkable, I have thought it my duty to put down my discovery on paper, so that all ingenious people might be informed thereof. Letter (27 Jun 1716) thanking the University of Louvain for ending him a medal designed in honour of his research. (Leeuwenhoek was then in his 84th year.) As cited by Charles-Edward Amory Winslow in The Conquest of Epidemic Disease: A Chapter in the History of Ideas (), 156.